3. K S Kahlon, H S Aulakh, N Singh, R Mittal, K L Allawadhi and B S Sood	Measurement of angular distribution and polarization of photon induced fluorescent X-rays in Th and U. 4. K S Kahlon, N Singh, R Mittal, K L Allawadhi and B S Sood	L3 subshell vacancy state alignment in photon atom collisions. 5. K S Kahlon, N Singh, R Mittal, B S Sood, K L Allawadhi Linear polarization of Ll and L2, X- rays lines of Gold. 6. K S Kahlon, K Shatendra, K L Allawadhi and B S Sood	Experimental investigation of angular dependence of photon induced L-shell x-rays emission intensity. Measurement of differential M shell X-ray emission cross-sections for bismuth. Measurement of Total M shell photoionization cross-section s for Au, Pb, Th and U in the energy range 6-12 keV. 14. Manoj Kumar Gupta, Baltej Singh Sidhu, K. S. Mann, K. S. Kahlon and A. S. Dhaliwal Study of CK Enhancement Factors for Oxygen Induced L Subshell X-rays in Lanthanum Series (58 ≤ Z ≤ 70). 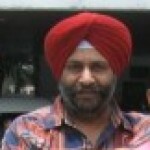 Baltej Singh Sidhu, A.S. Dhaliwal, K.S. Mann, K.S. Kahlon	Measurement of K-shell absorption edge jump factors and jump ratios of some medium Z elements using EDXRF technique, Radiation Physics and Chemistry 80 (2011) 28–32.